It was one of those laws that The Legal Genealogist loves … indeed, that would warm the cockles of the heart of any genealogist anywhere. 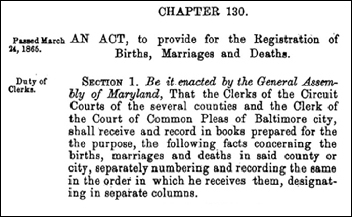 Passed by the General Assembly of Maryland — that state’s legislature — on the 24th of March 1865, it is entitled “An Act, to provide for the Registration of Births, Marriages and Deaths,”1 and I came across it while preparing for tomorrow’s Pratt Annual Genealogy Lecture — a set of four presentations on genealogy and the law at the Enoch Pratt Free Library in Baltimore. So… if you have Marylanders in your family tree who were born, married or died after the first of July 1865, you have a wonderful resource just waiting for you, don’t you? Because here’s something we don’t always keep in mind when we’re looking at these or any laws. They weren’t always followed or enforced. Now this doesn’t mean there aren’t any records for this time period. There are some registers for births, marriages and deaths created under this law and, of course, there are still church records that may be available. But the Maryland experience is a powerful reminder that, just because the law said something had to be done, it doesn’t mean it always was done. Our ancestors were no better at following rules they didn’t want to follow than we are today. Am unable to furnish Church Records for my marriage with Samuel Kilbourne for the following reasons. At the time of our marriage this Community was sparsely settled and no evidence of the marriage was kept on the church records of the Methodist Church. Rev Mr Simpers who performed the ceremony promised to send us a certificate of marriage at the time he performed the ceremony but was taken ill and died before doing so. Have made application to the Church Authorities and have been assured that no records of that date are now in existence. Ironically, two months later, Pastor W. L. White submitted a sworn affidavit on Mary’s behalf testifying that “In the matter of Mrs. Mary B. Kilbourn’s claim for pension as widow of Samuel Kilbourn, I hereby declare that the Records of the Methodist Episcopal Church at Chesterton, Kent Co., Md., show that Samuel Kilbourn aforesaid was married to Mary B. Vickers by Rev. T.W.Simpers, May,16th.,1865.” One hopes Pastor White did not perjure himself! General Affidavit concerning marriage records, Mary B. Kilbourne, 31 May 1906; widow’s pension application no. 842,966, WC 619,532, IC 589,626, 27 March 1906, for service of Samuel Kilbourn (Pvt., Co. B, 2nd Eastern Shore Md. Inf., Civil War); photocopy obtained from National Archives and Records Administration and privately held as of 2016 by Gary L. Ball-Kilbourne [address withheld for privacy]. Affidavit, W. L. White, 28 July 1906; Mary B. Kilbourn, widow’s pension application no. 842,966, 27 March 1906. What a wonderful piece of evidence THAT is — thanks!! In the 1950s one of my mother’s elderly aunts had a problem. She needed to get a passport in order to visit England. To get a passport she needed to prove she was an American citizen. To prove she was an American citizen she needed to prove she had been born in the USA. But she didn’t have a birth certificate and it soon became apparent that either the original document had been destroyed in a fire in the hall of records, or more likely, had never existed at all. All the older members of her family had died and at the height of the McCarthy era “Red Scares,” she was at the end of her wits trying to convince the government she was not a Communist “sleeper” using a false identity. Fortunately, she happened to have a friend, who happened to have a brother, who happened to be a professional genealogist, and he offered to help her out. Along with census records and obituaries proving she had been a member of her nuclear family since long before the Russian Revolution was even thought of, he sent her a note saying, ” You have a very interesting family,” along with pages of notes describing how her ancestors went all the way back to the 1600s in New England. It was when I opened this package after her death that the genealogy bug hopped out and bit me hard enough to spend 10 years tracking down all the sources of his information to see what evidence, if any, there might be to support any of it. In some places and times, births were not reported at all. My mother was born in a tiny frontier town in Sask. Canada in 1915, to a father who was a naturalized US citizen based on his own father’s naturalization. Her mother was born in the US. My grandmother’s intention to return to her own mother in Minnesota for the birth was foiled when my mother (the fourth child) arrived six weeks early. Mom was the first non-First Nations child born in this little town, and they hadn’t even thought of registering births. The family soon moved away. They did, however, keep in touch with the only doctor in town (who arrived at the family home too late to deliver Mom, but in time to cut the chord). My grandmother’s sister, a trained nurse, happened to be visiting, and she did the actual delivery. Fast forward to the 1950s, when my mother, now living in the US and having dropped the Canadian half of her dual citizenship so she could vote in the US, wanted to get a US passport. The immigration service put her through all kinds of hoops, most of which made no sense. The McCarthy scare is one I’ve never thought of, but it may have been one of them! They asked for proof she had been born, which her parents supplied as affidavits. That wasn’t good enough, so she provided similar letters from her aunt and the doctor. That wasn’t good enough either. They fiddled with other nonsensical requirements which were never enough. Ultimately they wanted, from the Old Country (Norway) proof of the marriage of my mother’s paternal grandparents, and her father’s baptism. Her father was the oldest child in the family, so apparently they were making sure he was “legitimate.” So her father, now in his 70s, wrote a letter in Norwegian, saying what documents needed. My mother sent it off to the Norwegian Archives in Oslo with more money than was necessary, and in two weeks had her proof. If they’d only told her in the first place what she really had to do, things would have been so much simpler! She was very careful never to let that passport lapse until, in her 90s, she decided against further foreign travel. One minor advantage of all this is that I have a copy of the actual marriage certificate and baptismal certificate, rather than the indexes from the church records which is what you usually get. I wouldn’t want to pay what she did for all my Norwegian and English ancestors, but it’s fun to have this one set.